The Kyoto Treaty came into being in February 2005. It is seen as a way for many of the world?s nations to stem the increase of CO2 emissions, protect the world?s ecosystems, and upgrade energy efficiency in a variety of areas. Trade volume in BBX trade dollar currency passed $100 million for the first time in the company?s history, totaling $146 million for the year and up 61% over last year. Scott Whitmer is the founder of Florida Barter, one of the larger independent trade exchanges, located in Orlando (FL). A proven veteran in the industry, he runs a very successful exchange. He?s also a past president of IRTA, and has held many other board positions. So his recent musing at the IRTA convention are noteworthy. According to Whitmer, our industry focuses almost exclusively on the owner of a business that is a member of one?s exchange. He suggests if you?d like to see more trading activity from this member, it would be a good idea to expand your vision and consider the owner?s spouse and kids. The Tradewinds Island Grand Resort in St. Petersburg Beach, Florida, was the site for the International Reciprocal Trade Association?s 27th Annual Convention that took place September 14 - 17. The strength of an international industry association is its openness and embracement of people from all countries and cultures. Innovations and new ideas are not the privy of any one country or people, as history shows. The synergy that results when bringing people together from Europe, Asia, North America and Mexico, is invigorating and energizing for all. There is a growing realization of the importance for industry standardization coupled with the formation of a new enabling organization that will operate outside of the industry?s trade associations. Standards include: Saying what you do, doing what you say, and proving it?with written records and results. Our industry will only become ?important? in world commerce when standardization occurs, much like the banking industry did. It raises the level of performance by all who cooperatively abide by agreed upon rules and regulations, for the greater benefit of all. If you want to get an idea of where an industry is headed, a good place to start is by attending its national convention. Because this is where it?s at...meeting and interacting with one?s peers. After all, success doesn?t exist in a vacuum. 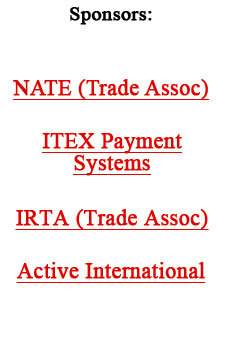 The International Reciprocal Trade Association?s Hall-Of-Fame is the highest honor IRTA bestows. The honor recognizes individuals whom the Hall Of Fame Inductees feel are regarded as an ?indisputable leader in the barter industry.? What makes an indisputable leader? Someone who has been in the barter industry for at least 10 continuous years, and has made universally recognized and specific contributions to the barter industry as a whole. Above all, inductees must be regarded in the industry as highly professional and ethical. I think many of you will agree that this description is just not big enough to adequately describe the person who we induct tonight to the IRTA Hall of Fame. David Wallach began his career in the Barter Industry in 1976, when he became associated with barter pioneer George Maddox of the United Trade Club. In 1979 Dave founded his own exchange, the American Trade Association. In that year he joined IRTA and attended the first general meeting in San Jose, California. He has been a continuous member of IRTA ever since. By 1986 American Trade Association had grown to be one of the top ten exchanges in the United States. David was an early innovator and visionary. He was the first to introduce seller paid service fees, maintain member reserve accounts, and integrate media ratio trading into the retail barter environment. In 1988, Dave received his first IRTA Distinguished Service Award when he worked to defeat legislation that, if enacted, would have had dire consequences not only in California but throughout the entire industry. Dave began a program of consolidation in 1995 when he purchased five local trade exchanges and renamed his company ValueCard. By 2000, ValueCard was the largest independent trade exchange on the West Coast with almost 4,000 clients, and the third largest exchange in the nation. Dave sold ValueCard to Intagio, a dot-com company, in 2001. Over the years, David has worked tirelessly to unite the industry. He has chaired the Ethics, Media, Government Affairs, and Awards committees. He was vice president of the IRTA North American Board, and to this day serves on the IRTA Global Board. Dave continues to have a vision for the worldwide trade industry. He feels that the trade currency system could benefit the world economy, especially in developing economy?s that are short on cash and long on excess capacity. He believes that our commercial currency could raise the world?s standard of living, and provide a substantial increase in nutrition, education and healthcare. He has attended conferences focused on developing alternative currencies, and as result is studying viable synergies between commercial barter and community currency systems. In his local community David is well known for his charitable and humanitarian work. The Leukemia Society of Northern California recognized David naming him the 1992 Man of Year. He has also been a fifteen-year active board member of an organization in San Francisco that teaches homeless people how to feed themselves. His three-decade long career continues to be a glowing example of industry service, sharing of expertise, innovation, ethics, leadership and vision. Not to mention that he is just a great guy. For all of these reasons, and for many more that I am certain to have missed, I am deeply honored to present IRTA?s 2006 Hall of Fame inductee, David Wallach. It is a great pleasure for me to be here with you tonight. As many of you know, because of some very serious health issues I was unable to attend last year?s convention. In July of 2005 my doctors gave me between four and seven months to live. They were mistaken. I want to give my thanks for the overwhelming and prayerful support I have received from my friends in the industry, my family and loved ones. I am absolutely sure that this wonderful outpouring is the reason I am here tonight. I was deeply moved, and totally blown away, when I was informed by Krista and the IRTA Global Board of Directors that I was to be inducted in to the Barter Hall of Fame. It will be a great honor to have my name listed and along side barter industry greats, legends, leaders and visionaries. Hall of famers that are present please stand up as I call your names...Bob Meyer, Paul Suplizio, and Steve Webster. These remarkable people represent an industry that has collectively conceived, designed, shaped, defined, and brought to the market place a system of currency that expresses the ultimate in business efficiency and ecology. This is my 30th year in this fantastic industry: and what a wild and wonderful ride it has been and continues to be. Because of opportune timing, I have had the privilege to witness and participate in some of the most historic events that have formed our business. IRTA was our first governing body, and from its inception has provided the organization, the wisdom, and a dedicated cadre of leaders that seem to have always been there at exactly the right time. The people of IRTA have negotiated industry legal status with the federal governments, provided a code of ethics, put into place financial standards, organized corporate operators, and has members and affiliates world wide. From Paul Suplizio to Krista Vardabash, we have been and still are, in great hands. As we bring our burgeoning industry into the twenty-first century, we can be confident that a strong foundation and framework for future growth, has been put into place. At this point, the Alternative Business Currency Industry has an estimated global business client base of 400,000. This number, though impressive, represents a relatively small share...less than one-half of one-percent of the estimated total of 65 to 100 million businesses worldwide. By achieving a 20% market penetration, we would welcome 13 to 20 million new business users into our currency systems. Obviously we need to apply some serious resources to the task of impacting this huge market with our positive message. Before organizing this huge undertaking, we need to be assured that the information and message imparted truly represents what we do. During early development, our product concept was defined as administrating the process of ?bartering, trading and exchanging.? At some point in our learning curve we have discovered that we do not engage in any of those activities. Much of the confusion about our product can be directly traced to our use of the words trade, barter and exchange...these words wrongly describe what we do. We do not trade, barter or exchange. Each of those processes implies a direct exchange of a product or service between two or more parties usually at the time of the transaction. Besides these descriptions and terms conjure up images of an ancient market place, where merchants hawk their wares...bargaining, bickering and taking advantage of one other. We operate an ultra-modern currency system that allows businesses to mutually access and utilize their excess capacities of products, services, labor, space or time to their profit. And the whole world?s economies benefit. Our business currency systems use the latest computers, software, web related communication, and credit card technologies in a cooperative climate that facilitates millions of client buy and sell transactions. We need to clarify and re-brand our product conception in order to more correctly describe and identify what our industry is about. In short we do not need to change what we do but how we define what we do. By clarifying our definition we will be even more successful in demonstrating to the business and financial community how to use our currency to access and profit from what is unsold and wasted. Our currency of the unsold, transforms inventories that are neglected and wasted into useful resources that capitalize businesses, create employment, and stimulate the world?s economy. For the most part, those resources that go unsold for cash are forever lost and totally wasted. Worldwide, this totals in the trillions of euros in lost business and tax revenues. Lost and forgotten revenues that could provide for fuller employment, education, healthcare and nutrition, for millions of struggling people worldwide. As business ecologists it is our mission to provide a viable and dynamic system of currency that facilitates the profitable use of what goes unsold, unused and forgotten. Now is the time for our industry to unite, and then go forward to fulfill its destiny. We need to tell our story in a clear and understandable way, to a world that is ready and waiting for solutions to problems our product can and will answer. Please be assured that I am with you until the very end. Trade through barter encouraged...Mehmet Burkay, Bursa branch chairman of the Association of independent industrialists and businessmen (MUSIAD), said that a Foreign Trade Ministry should be founded in order for Turkey to increase its exports. He suggested that trade through barter be encouraged with neighboring countries such as Iran and Russia, which are in need of foreign exchange. For the list of five barter companies located in Turkey see: http://www.barternews.com/mappage/worldwide.htm. Barter in Iran...Nearly 500 foreign and domestic companies have applied for a newly established Iranian Barter Market. It?s predicted that the market will be capable of handling up to 20% of the nation?s business affairs. Barter deals are expected to be carried out through bank drafts for safety and convenience. Powerful megatrend to continue...The International Monetary Fund (IMF) says that China is the world?s leading economic powerhouse, pushing global growth to its highest pace since the early 1970s. It is anticipated that China will grow a whopping 10% this year, as well as another 10% next year. A growth that?s three times faster than the U.S., and far faster than any of the leading industrial nations in the world, including Japan, Germany, Britain, France, Italy and Canada.